It hasn't been an easy few lunar months for the Yutu rover, which reportedly had problems positioning its solar panels in March while exploring the lunar surface. That said, reports are emerging that the rover is still alive. Along with those reports came a new panorama released in time for the Moon Festival in that country. As you can see in the video above, the new panorama shows the Chang'e-3 lander and the tracks of the Yutu rover in the Mare Imbrium (Sea of Rains). The duo landed on the Moon on Dec. 14, 2013, with the rover on the top. Yutu then drove on its six wheels on to the surface only about seven hours after the touchdown happened. According to the Twitter account UHF Satcom, the X-band carrier signal for Yutu was strongly audible from Earth yesterday (Sept. 7), although the lander was not audible. 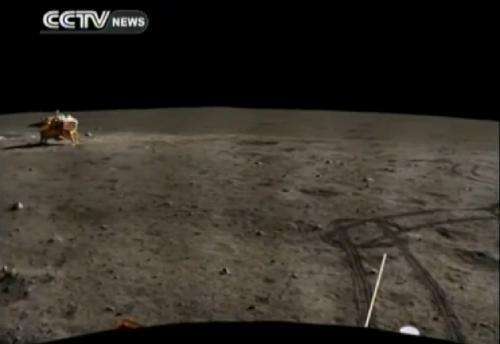 Yutu Rover is back! X-Band carrier loud and clear – amazing! FFT @ t.co/JZaYaAYpjg No signals from Chang'e'3 lander though.